move the coil but not the magnet. move the magnet but not the coil. move either the coil or the magnet. It is not possible to produce current. 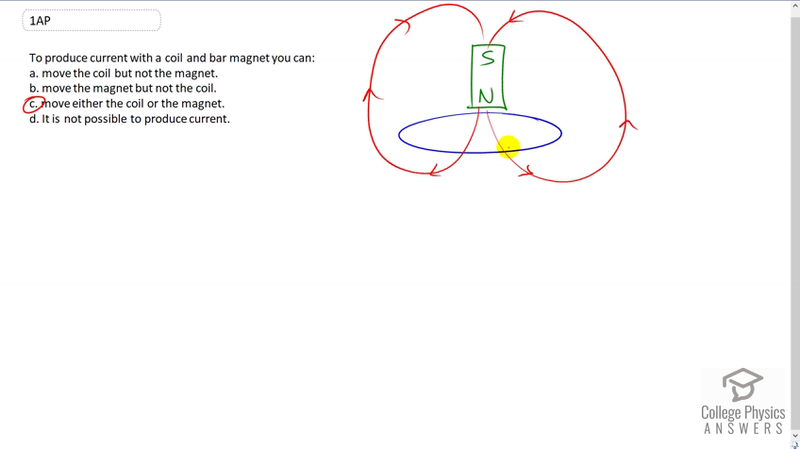 This is College Physics Answers with Shaun Dychko To produce current with a coil and a bar magnet, you can move either the coil or the magnet. The only thing that's important is that you change the magnetic flux through the coil. And so if you move the coil away from the magnetic, you're going to be decreasing the magnetic flux because you're gonna be decreasing the magnetic field strength as you go further away from the magnet and that will induce a current. Or you can leave the coil where it is and move the magnet away from the coil, in which case you'll also be reducing the magnetic field strength in the coil and thereby reducing the magnetic flux, and in so doing causing an induced current. So whichever way you look at it, if you can change the flux, you can induce a current. So, C is the answer.